The unveiling Tuesday of the Sony Xperia Z Ultra had some hearts beating faster and drool dropping out of some mouths. The 6.44 inch glass on the device takes it past the Samsung Galaxy Mega 6.3 by .14 of an inch to become the largest-screened smartphone in the industry. Sony's Product Design Director, Jun Katsunuma, who was responsible for designing the eagerly awaited model, was in Shanghai where he talked on the record about the device. Katsunuma's work on the Xperia line goes back to the Sony Xperia S. You might remember that model for the translucent strip that doubled as a notification light near the bottom of the phone. That little strip helped the device catch quite a buzz. 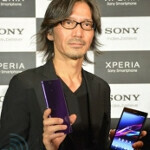 Katsunuma discussed the difference between the Sony Xperia Z, which he says uses a plastic frame, and the Xperia Z Ultra which uses aluminum side plates. This allowed Sony to make it thinner than the Xperia Z. The latter is 7.9mm thick while the Xperia Z Ultra weighs in at 6.5mm thick. Another difference between the two high-end models revolves around the color purple. Both can be purchased in black, white and purple although the 6.44 inch model uses a solid purple instead of the glittery purple used on the Sony Xperia Z. The reason? It seems that a solid purple color just looks better on the larger model. So why choose a 6.44 inch screen? Why not round it off to 6.45? Katsunuma said that the 6.44 inch screen happened to perfectly fit a body that would be the thickness and length of a passport. Sony was aiming for that size because many travelers put their passports inside a coat pocket and have it with them at all times while on the road. And by allowing the use of a regular pen to scribble on the glass, travelers using the device won't have to carry around a stylus. While the screen is not made of Gorilla Glass, it is supposedly just as tough. if the bezel is too small, it wouldnt be practical in handling the smartphone, i mean like typing or navigating on screen. i guess it has some new tech in camera. childish design & plastic = even uglier! Side bezels are perfect but yeah, too much space at the top and bottom. Even Galaxt Mega 6.3 looks much smaller compared to Xperia ZU. low ppi...is this troll serious ?? Low ppi? No But thick bezels, lack of flash, small battery....Yes!! once you get used to 441ppi you can never make a downgrade!if it were tab it wouldve been ok coz i have flagship phones along with it which comes with dense pixels to consolideate.are you getting my point? So, your laptop has 19200 X 10800 or something around that resolution to satisfy your need for 440pp? Are you mutant or bionic? Or something that has microscopic eye vision? You're not supposed to put the phone 10cm from your eyes. It's like saying that 4k on 32 inch - televisions aren't enough. You are exaggerating.. unless you are seeing a 720p screen on a laptop and 1080p on mobile.. otherwise even 720p is good enough resolution till 4.5 to 5 inches. I agree that a phone with 6.4' inch display should've better res than 1080p but still not a deal breaker.. Good thing is the display tech on this is better so viewing angles and colors look good. No flash is a no go for me! You think 342 PPI is low? Scumsung Galaxy Note II has lower PPI (267). Perhaps you see your phone 1mm from your eyes? Just give me the damn z ultra already. If you are in the U.S., be prepared for a bit of a wait. :-( Sony hasn't exactly set records for rollout speed in the U.S. in times past.